What makes this Westside Subway proposal different from all the others? A proposal from 1961 would have linked El Monte to Westwood via downtown. The threat of a Soviet nuclear attack meant planners could pitch subway stations as fallout shelters too. It’s a simple idea: Connect the jobs-rich and traffic-choked Westside of Los Angeles County to downtown L.A., the heart of the region’s economy and public transit network. Yet, as of this moment, I can’t hop on the subway in Westwood and make it to downtown in about 25 minutes — though that’s the future when the current Westside Subway Extension comes to fruition. It’s well known — part of the city’s legend, really — that there have been seemingly a dozen proposals for such a transit line, many dating back to the middle of the last century. With such an illustrious history, I’m sure many of you are wondering skeptically: What makes this Westside Subway proposal different from all those others? That’s a fair question. Before traipsing back in time through the various iterations of the Westside subway concept, we’d like to highlight a key difference between then and now: The current Westside Subway Plan has funding both through the Measure R sales tax increase approved by voters in 2008, as well as federal dollars. The Metro Board of Director’s vote on the final environmental study for the project later this year will clear the way for finalizing the engineering and then putting actual shovels in the ground. All other subway plans for the Wilshire Boulevard have died on the vine at various phases. So I sat down with Metro Librarian Matthew Barrett to get the story on each of the erstwhile proposals that have paved the way for the Westside Subway Extension. 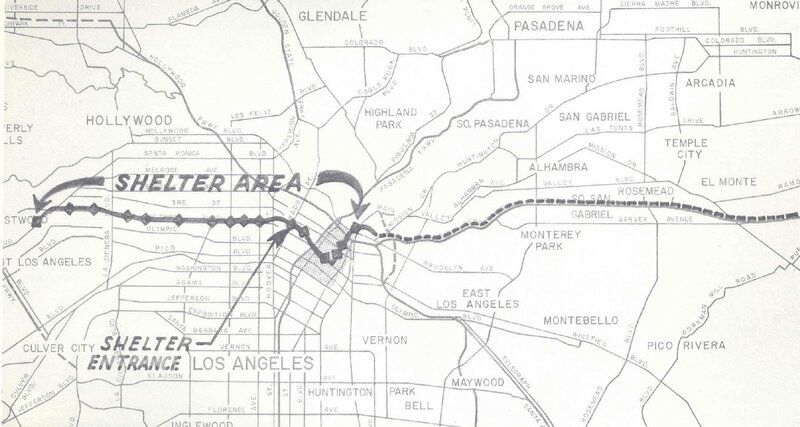 A map from the 1960s considers how a subway might travel along the Wilshire corridor through Miracle Mile. First, it’s important to note why proposed transit for Wilshire Boulevard has always taken the form of a subway or monorail — not street-level light rail. It’s a bit of legal trivia that goes back to Wilshire’s inception as the “Grand Concourse of Los Angeles,” the title of Kevin Roderick’s book on the Boulevard. This post from the Metro Primary Resources blog describes how the property developers who built Wilshire in the 1920s insisted that the city of L.A. ban streetcars from traveling along Wilshire; the city obliged. The trolly ban on Wilshire stands in stark contrast with the city’s other east-west thoroughfares — Hollywood, Sunset, Santa Monica, Pico, Venice, etc. — all of which had local streetcar lines or long-distance inter-urban lines, as depicted in this L.A. transit map from 1928. Click through for a high resolution scan by David Rumsey Map Collection. The idea of a subway to the Westside wouldn’t surface, however, for several decades. In 1961, a predecessor agency to the present-day Metro, known also as the MTA, sought a federal loan to construct a “backbone” transit line that would run above ground from El Monte to downtown. The line would then tunnel westward under Wilshire Boulevard to the newly minted Century City district — formerly a 20th Century Fox studio back lot — as well as UCLA and other points west. The former MTA was the project’s proponent, but it lacked the authority to levy local taxes to pay for it. The project fell through when the federal government declined to help the agency finance the project. The state Legislature would eventually dissolve the MTA and replace it with the Southern California Rapid Transit District (SCRTD), which was given the power of eminent domain and taxation with voter approval — two crucial tools for a transit builder. The SCRTD proposed a similar plan for the Westside in 1968 as one of five corridors in a more comprehensive rapid transit plan for the region. The 90-mile system — modeled broadly on the plans for Bay Area Rapid Transit — was estimated to cost $2.5 billion to build. But the ballot measure to fund the system fell to defeat by a margin of 55-to-45 percent. A general anti-tax sentiment carried the day, as well as perhaps the sense that the need for a modern mass transit system wasn’t urgent. Regrettably, voters of the day didn’t have the foresight to see what Wilshire Boulevard could look like at 5 p.m. on a 21st century weekday — or any time of day for that matter. This video from the Metro Transportation Library depicts L.A. County Fair–goers experiencing RTD’s vision for a modern transit system. Undeterred, RTD came back with another proposal on the ballot in 1974: a 116-mile system that would be built over 12 years at a cost of $6.6 billion, funded by a one-cent sales tax increase. The Wilshire corridor again features prominently in the plan, this time all the way to the coast in Santa Monica. However, despite the 1973 oil crisis, voters once again balked and sent the measure to a 46 percent to 54 percent defeat among L.A. County voters. 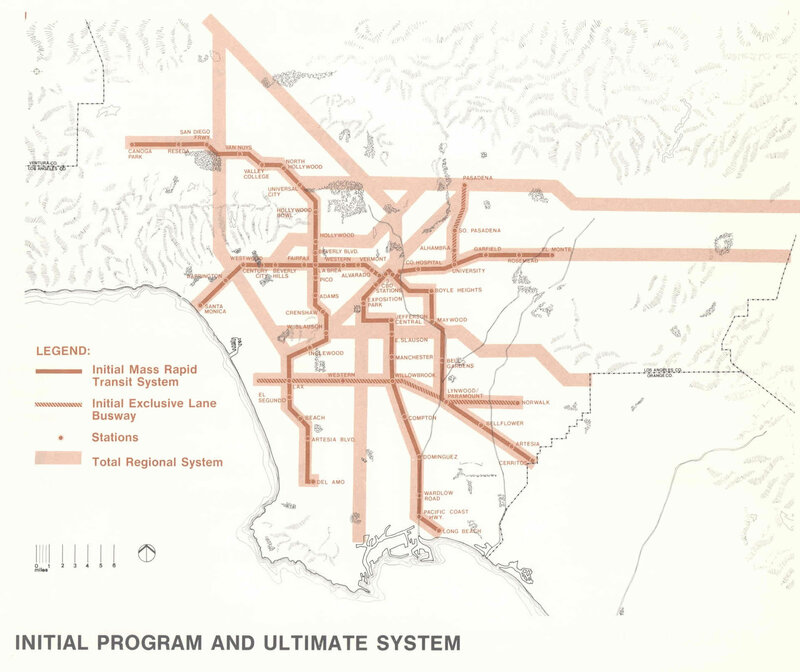 The 1974 proposed transit master plan concept map for L.A. County. Just two years later, then-County Supervisor Baxter Ward pitched a new plan to voters. The “Sunset Coast Line” — really a series of lines — would build 200-plus miles of heavy and light rail transit mostly along the region’s freeways and old streetcar rights-of-way. One particularly important route in Ward’s plan was the Wilshire corridor to the Westside. Among other notable things, the proposed rail cars for the Sunset Coast Line featured special compartments for bikes and surfboards. County Sup. 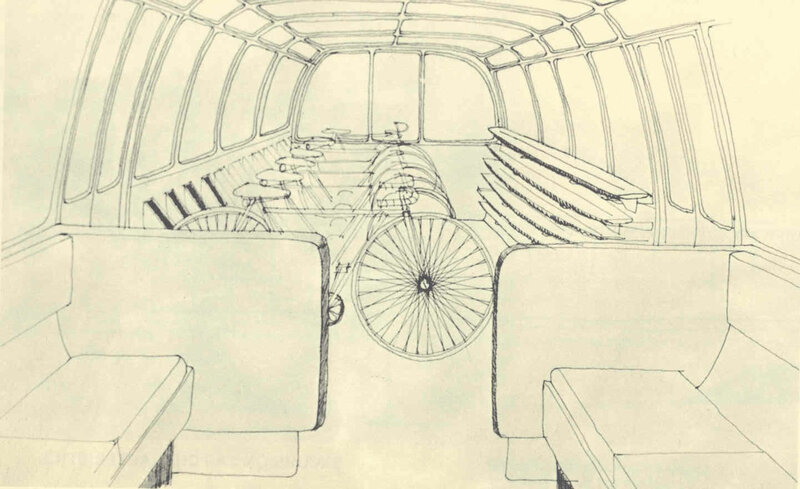 Ward envisioned train cars with ample room for surf boards and bicycles. County voters, however, once again voted down the plan in 1976 — as well as another scaled back version in 1978 — perhaps daunted by the scale and cost of building a comprehensive system all at once. Finally, with traffic getting worse and smog still pretty awful,1980 would prove to be the year it all came together. County voters passed Proposition A — and then Proposition C 10 in 1990. The two half-cent sales tax increases would generate the needed revenue and political momentum to begin building starter lines in what would eventually become a regional high-speed, high-capacity transit network. Props A and C provided the requisite local funding to build Blue, Green, Red and Gold Lines, without which we probably wouldn’t be talking about a Westside subway extension at all. Of course, the existing subway was originally supposed to go as far west as Pico and San Vicente boulevards. But that all changed in 1985 when a pocket of methane gas exploded at a Ross Dress for Less at 3rd Street and Fairfax. The explosion did not involve subway tunneling but community members and public officials were shaken up. Congress subsequently banned federal funds for subway tunneling through the officially designated methane gas hazard zone. The subway to the San Fernando Valley was re-routed via Vermont Avenue. Construction problems on the Red Line in Hollywood and MTA financial difficulties lead to voters approving a 1998 county measure prohibiting local Proposition A and C sales tax funds from being used for subway tunneling. That killed the subway extension to Pico and San Vicente. In October 2005, at the request of Metro and the Mayor of the City of Los Angeles, the American Public Transportation Association (APTA) conducted a Peer Review to reconsider the feasibility of tunneling along the federally precluded Wilshire Boulevard segment of the Westside Corridor. As a result of this review, which concluded that tunnels could be safely constructed and operated along Wilshire Boulevard due to advances in new tunnel construction methods that were previously unavailable, legislation was enacted in Congress repealing the Federal prohibition on subway funding in December 2007. These moves cleared the project of any legislative hurdles. Still, there was the not-so-small issue of several billion dollars it would take to get the subway deep into the Westside. The federal government wasn’t going to pay for the entire project and state funds were unlikely due to California’s chronic budget problems. The only practical recourse was some type of local tax and ultimately local officials decided to pursue another half-cent sales tax in the form of Measure R, placed on the November 2008 ballot to coincide with a presidential election. It needed a super-majority to pass — a threshold that it sailed past about 1 a.m. on election night, thanks to the large local turnout spurred by the Barack Obama-John McCain race at the top of the ballot. Measure R included money for a wide variety of transit and road projects, including the Westside Subway Extension. Mobility Improvement—The primary purpose of the project is to improve public transit service and mobility in the Westside Extension Transit Corridor. To compare the alternatives in terms of mobility improvement, the evaluation examines how well each alternative improves the ability of residents and employees to reach desired destinations through the provision of high quality, convenient, and reliable east-west transit service. Transit Supportive Land Use Policies and Conditions—A major aspect of this goal is to locate transit alignments and stations in areas with existing land uses conducive to transit use or in those areas that have the greatest potential to develop transit supportive land uses. Cost-Effectiveness—This goal ensures that both the capital and operating costs of the project are commensurate with its benefits. Project Feasibility—The fourth goal is that the project be financially feasible. Specifically, this goal helps ensure that funds for the construction and operation will be readily available and will not place undue burdens on the sources of those funds. The goal also includes minimizing risks associated with project construction. Equity—This goal evaluates project solutions based on how fairly the costs and benefits are distributed across different population groups with particular emphasis on serving transit-dependent communities. Environmental Considerations—The sixth goal is to develop solutions which minimize impacts to environmental resources and communities within the study area. Public Acceptance—This goal aims to develop solutions that are supported by the public with special emphasis on residents and businesses within the study area. In October 2010, the Metro Board selected for final environmental analysis the alignment that would extend the subway from Wilshire/Western Station to the Veterans Administration hospital, connecting Miracle Mile, Mid-Wilshire, Beverly Hills, Century City and Westwood along the way. As you keep an eye on the Westside Subway Extension’s progress — the present-day version — take heart in knowing that we have what no generation of Angelenos has had before: a concrete plan of action, with funding, to build a subway from downtown to the Westside along Wilshire Boulevard. If only subway projects are cheaper, funding for them will not be an issue. It would be great if local taxes entirely funded the Westside Subway construction, but due to the high costs, other forms of funding is needed. Even if the Subway is finally completed, it will be decades until we see it.